Some of the links in this post are “affiliate links.” This means if you click on the link and purchase the item, I will receive an affiliate commission. Regardless, I only recommend products or services I use personally and believe will add value to my readers.”I have a confession to make. I have been married for 21 years and 11 months and until last weekend I had never cooked a whole chicken! <gasp> I’m not sure exactly why this is. It could be because it is easy and convenient to buy boneless, skinless chicken breasts and cook them. It could be because I don’t remember my mother ever cooking a whole chicken…though she probably did. It could also be the vivid memory I have of being a young adult visiting my then boyfriend’s Italian home and witnessing his mother and sisters attack and molest a rather large chicken that they were preparing for our dinner. It all just looked too complicated, so I never tried. Recently, I received a 5lb frozen whole chicken from the food pantry. I brought it home and my husband asked, “What are you going to do with that?” I told him I was going to find a recipe on Pinterest and I was going to figure out how to cook it. 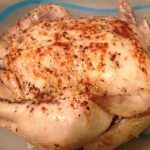 I culled several recipes on my Recipes I Want to Try board and last weekend I bravely made my first ever whole chicken. Why did I wait so long to learn to cook a whole chicken??? 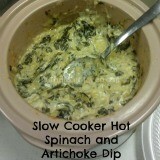 This recipe is soooo easy and very delicious. The whole family enjoyed it and we had leftovers. There were just enough leftovers for hubby and I so we heated them up with barbecue sauce and got 2 meals of out the chicken. 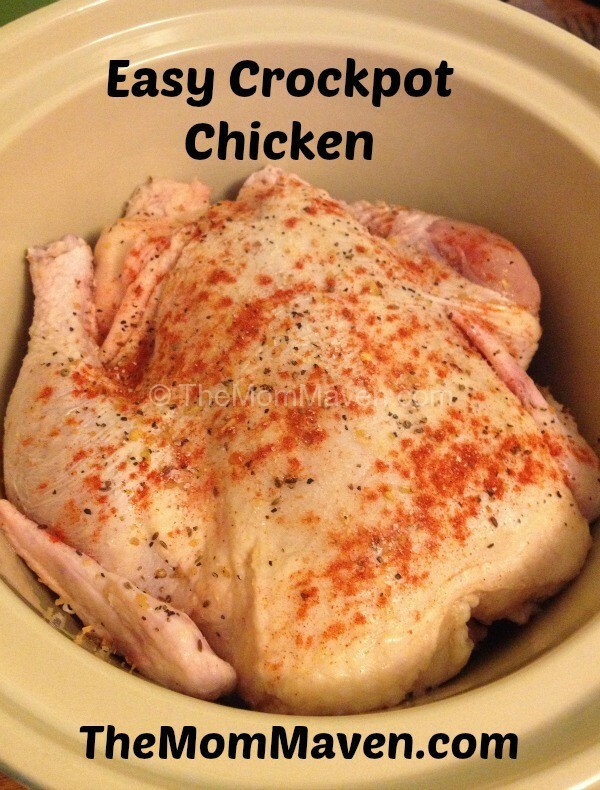 This recipe is going into my regular meal rotation since it it affordable, easy and delicious…just remember to defrost the chicken the day before you want to cook it. 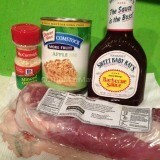 This is the easiest wy to cook a whole chicken to feed a hungry crowd, or to have leftovers for other meals. 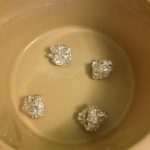 Make 4 small aluminum foil balls and place them in the bottom of your crockpot. These will lift the chicken up a bit and will keep it from getting mushy on the bottom from sitting in its own juices while it cooks. Remove anything inside the chicken. Let the chicken rest on the cutting board for 15-20 minutes before carving. Next time I would add more of each spice and I would also put some spices under the skin to help infuse more flavor into the meat. Have you been chicken to try like I was? 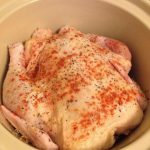 You can make this Crockpot Chicken! How do you cook a whole chicken? Leave me a comment and let me know. 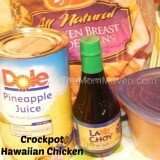 What a great idea to put those aluminum foil balls on the bottom of the crock pot to avoid mushy chicken! I’ll have to do that next time! Susan, it works really well! With just two people to cook for. 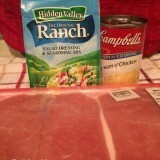 I think I will try this with chicken breast & a shorter cooking time. Thanks for the idea. Right now it’s all about high protein.